It's not Glenn McGrath, Shoaib Akhtar , Courtney Walsh or Shane Warne whose delivery Rahul Dravid fears most. Instead, it is that of his two-year-old son Samit, the former India captain told BBC's Indian Editor, Sanjeev Srivastava, at the popular radio programme 'BBC Ek Mulaqat with Rahul' on Thursday. Talking to Srivastava on how he spends time when he is out of the team, the 'The Wall' said, "My son asks me new questions. Sometimes I can't answer his questions. It is very interesting to watch him grow. He is very fascinating to me.My time at home usually surrounds my two-year-old son and his list of unanswerable questions." Cricket reminds Rahul of his childhood memories — of how he felt bad and broke into tears as a kid, when the school team (in which he played), lost against to the opposite school team. “Cricket is my love and passion. Although I used to play hockey and other games too, I knew that cricket was where I had to be,” Rahul recollected. The host enquired about Rahul being a genius at school, and pat came the reply: “Everyone needs a back-up, right? My parents always wanted me to be prepared, if I couldn’t make the cut to cricket. He loves listening to the radio commentaries on cricket matches, as they expand the imagination levels and “make the game more exciting”. The Wall also commented on his public persona as a solid and dependable person. “I never actually made an effort to become what I did.Somebody once told me that once you entered the field of cricket, the impression a player made on the spectators, during the first two years, usually stuck with you. So, I guess I was just one of the lucky ones (to get off with a positive impression),” said Rahul. Rahul’s favourite actors in Bollywood are Amitabh Bachchan and Aamir Khan. Always known to be a gentleman, he is crazy about home-cooked food. "My son chants particular lines from a Hindi movie which he likes so much, but I can't sing, because I don't know singing." Dravid's eyes turned flashy while talking about the tot. He said he found solace at times spending time with his son in a busy cricket schedule, as his wife also travelled sometimes with him. The man who keeps vigil on a cricket ball and calculates how to send it to the fence or beyond for a six, was, however, not lucky enough to get a glimpse of beautiful girls sitting on the stands watching cricket matches. It is not him to be blamed for not taking a look at the pretty girls or women, but the fielding positions he is put in -- either behind the wicket as keeper or at slips, Srivastava opined. Dravid said his team mate Irfan Pathan was lucky as he is always deployed at the boundary line. "You the interviewer should ask Irfan about these things. I am always placed behind wickets or at slips. How can I react to this query?" Dravid quipped as the audience, including media persons, invited for the programme, burst into laughter. Cricket has become famous in India as it has a vast following and can even be played on streets with any kind of ball and a wooden piece, Dravid said, justifying the love people have for the game. Asked whether he watches cricket matches and comments on strokes or deliveries when he is out of the playing squad, he said: "I do watch TV when Sachin plays, but not the whole time. When I am at home I spend time with my family. But people have done this game great." Going down the memory lane, he said: "Whenever I used to get out playing cricket, I used to feel sad. Those days, the electric pole served as wickets, a ball, either rubber or tennis, was enough to play and all we required was a wooden piece to hammer the ball," he said. Dravid, who was nick-named Johnny by his childhood friends, including 'Mysore Express' Javagal Srinath, decided to cling on to cricket instead of hockey. "I am also called The Wall. It doesn't really bother me. Sometime later, people may write wall is cracking or wall is falling," he said. Dravid said he enjoyed watching Bollywood blockbusters like Chak De! India, Rang De Basanti ,Tare Zamin Par and musical compositions by A R Rehman. He said he did not consciously make any effort to cultivate an image of a 'cool and calm man'. "I never thought about it. I tried to be myself. I always played cricket and tried to live a natural way of life. "Experience changes the man. When you see the world, your personality and thoughts change," he said, adding "sometimes images of celebrities get exaggerated." "Sunil Gavaskar , Kapil Dev G R Vishwanath are my role models. They are big heroes for me," he said. 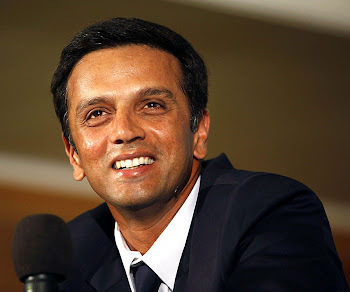 Dravid described Sachin Tendulkar a "big hero" and said he admired Anil Kumble , Sourav Ganguly V V S Laxman. "Laxman is a talented player, but he did not get his due," he opined. Like cricket, other games should also grow and their players get better rewards, he said.